It's just not true that we run out of ideas or we lose our creativity. The more we exercise our creative muscle, the more we are able to produce outstanding results. Nevertheless sometimes we hit walls or feel in a fog. And sometimes social media is accused of bringing us to this state of saturation or complete drought. I use Facebook, Twitter, and the rest to spur my ideas, and you can, too. 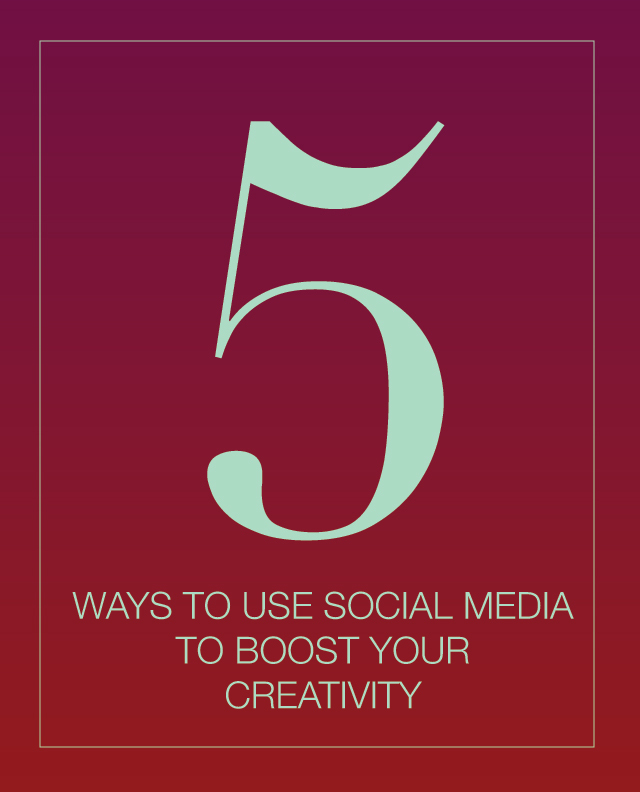 Here are five ways to use social media to boost your creativity. 1. If you're on social media, you're likely to have a favorite or at least a favorite for now. As a graphic designer and a visual fiend, I adore Instagram for inspiration. Find the feeds that will make you want to dive into the images and bask in the compositions. Use Instagram to observe all you can. Take note of the tones and shadows, the mood expressed in the images (and how this is achieved), the caption and/or story that accompanies the photography. How can these influence your work? Which posts feel "successful" to you and what elements can you bring to your own creations? 2. Facebook has changed quite a bit in its ten-year history, but it still has the power to put fresh perspectives right on your screen. How so? Start a conversation. For many of us, the majority of our connections still hang out on Facebook. This is a perfect opportunity to reach out and leave messages. Ask questions from your experts and gather collective feelings. Wondering how to find the best new apps? Ask your friends. Looking for fresh ideas on summer vacation? Solicit others thoughts. 3. I find Twitter to be the most charming of the social media that I use. From the silly hashtags that folks post to the easy back-and-forth of short communication to simple sharing of interesting links, Twitter can give you the quick feedback that you seek. I often use my feed to see what is on the minds of influencers and what are the quirkly, less popular, conversations going on that really bring something new to the table. Twitter can also be one of the easiest ways to break a train of thought (in the best way), and redirect you to another concept. It's also incredibly easy to spend endless time on this network so be sure to set your limits. 4. Google+ is an intriguing platform for inspiration. Much like Instagram, it favors the visual, and much like Twitter, you can utilize hashtags to find related information. I use Google+ to search out keywords and see what ideas and images come through. In my experience thus far, I've found a wide breadth of expressions on the same topic, and I've been inspired to think in ever-widening circles just as the platform's process itself implies. Add your post to Google+ and tag it, click on that tag, and read the myriad of other tidbits to broaden your perspective. 5. Pinterest is an amazing source of creativity for some, while others intentionally keep a distance from it when they are looking to imagine. I use Pinterest much like I did college art assignments. Let's say I want to do an Easter egg project - I first look through my board to see what's caught my eye, and in particular I look at pins that have been added to wrap up posts or projects that have a lot of repins. And then my brainstorming process begins. I think through and write out all of the "obvious" connections to the most popular ideas, and get all of the imitation ideas out. That process of getting it all out allows me to unearth something fresh. In many ways, Pinterest is most helpful in giving me the fodder I need to run the other way, but in the right direction. I go back to my boards to look at other processes folks have used to see how I might incorporate something unexpected to this new effort. How do you boost your creativity? Do you find social media helpful in this?